As if the recent deaths of Bob Sheppard and George Steinbrenner weren’t enough to detract from the celebratory mood of the Yankees annual Old Timer’s Day festivities, the absence of Yogi Berra deprived the Stadium crowd of another chance to say hello to a legend during a week defined by too many goodbyes. 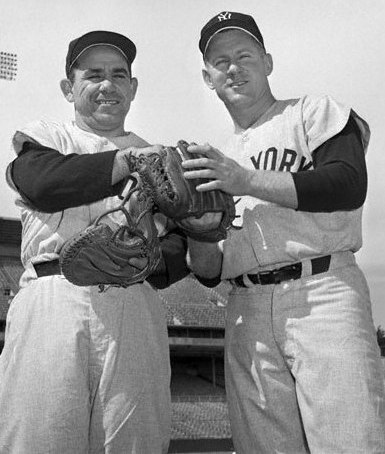 Along with Whitey Ford, Berra is one of the few remaining players of prominence from the 1950 team, so his absence left a void in the festivities. Even more significantly, the events of the week have shined a light on the mortality of both Yankees legends. 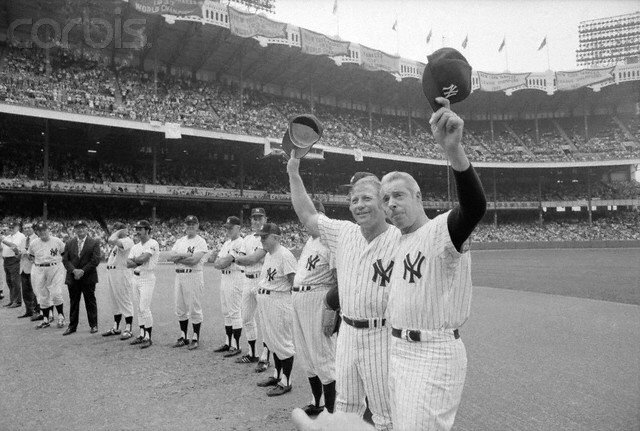 Berra and Ford are the last links to the Yankee Dynasties of DiMaggio and Mantle, so each appearance that they make on the Stadium field should be cherished..
For years, DiMaggio and Mantle, pictured here on the last Old Timer's Day at the original Stadium, presided over the annual ceremonies, an honor that now belongs to Yogi Berra and Whitey Ford. As legends like DiMaggio, Mantle, Rizzuto and Maris, to name just a few, have passed away, the heralded Old Timer’s Days of the 1970s and 1980s have begun to lose their luster. Great Yankees players from the 1970s like Reggie, Goose, Guidry and Nettles have replenished the day’s star power, but the barren era of the mid-1980s to early-1990s has left a void in the constellation, especially with Mattingly’s and Winfield’s other engagements frequently keeping them away from the ceremony. Fortunately for Yankees fans, guys like Cone, O’Neill, Tino are starting to enter the fold, while current stars like Jeter, Posada, Rivera, Pettitte and Arod will eventually provide the younger generations of fans a reason to celebrate the memories of their youths. In the meantime, Yogi and Whitey remain the centerpieces of the current Old Timer’s Day, and one can only hope that is true for many years to come. 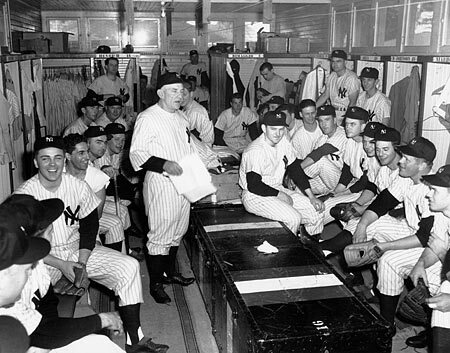 Casey Stengel presides over the 1950 Yankees during Spring Training.